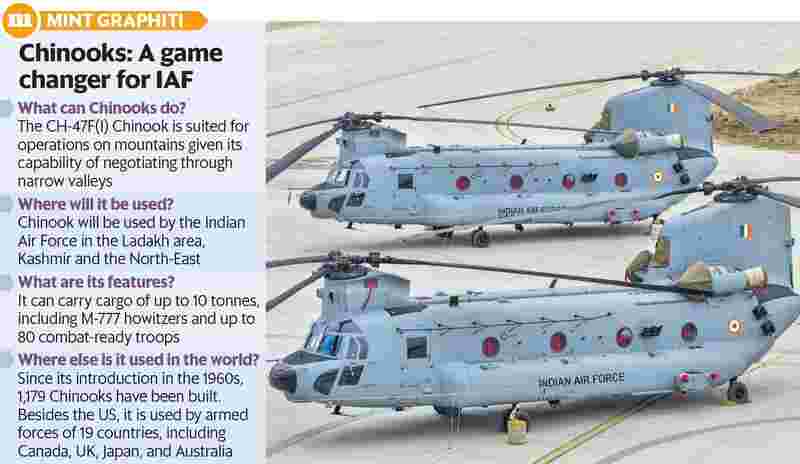 NEW DELHI: The Indian Air Force (IAF) on Monday inducted the first four Chinook helicopters capable of transporting artillery guns and combat-ready troops to forward and high-altitude areas, especially along India’s borders with Pakistan and China. The acquisition not only boosts India’s defence preparedness vis-a-vis Pakistan and China through the swift deployment of men and machines, but also places the India-US defence partnership on a firmer footing. The first of the iconic machines, with their unmistakable twin tandem rotors, became part of the IAF’s 126 Helicopter Flight squadron at an official ceremony in Chandigarh presided over by IAF chief B.S. Dhanoa. The helicopters are a “national asset” and a “game changer” for the IAF, Dhanoa said at the induction ceremony. Given its all-weather and day-and-night operation capabilities, the Chinooks would “redefine” the IAF’s heli-lift capacity, said the IAF chief. “Our country faces a multitude of security challenges. We require vertical lift capability across a very diversified terrain—places from the sea level to high-altitude landing grounds. 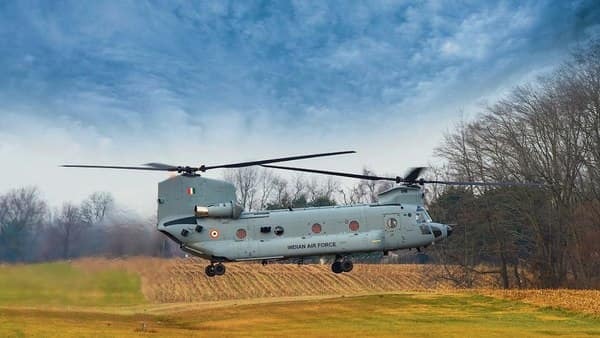 We have procured the Chinooks with India-specific enhancements to increase the flexibility of the platform across the entire spectrum of heavy-lift operations, including search and rescue and air ambulance roles,” he said. “The CH-47F(I) Chinook will prove to be a significant force multiplier for the Indian Air Force,” said Salil Gupte, president, Boeing India. “We are committed to working closely with the defence forces and government of India to deliver the right value and capabilities,” he said. Manmohan Bahadur, a former assistant chief of air staff, said that the very fact that the Chinooks would be stationed at two bases, in Chandigarh near the border with Pakistan, and in Assam close to the India-China border, was in itself a statement about their role. India has unsettled borders and uneasy ties with both countries. The induction of the Chinook also gives a big boost to the humanitarian assistance and disaster relief (HADR) efforts of the IAF, Bahadur said. With C-17 Hercules capable of transporting Chinooks to any location requiring disaster relief, it extends India’s capacity to provide HADR coverage to countries beyond its immediate neighbourhood, Bahadur said.